We'll never "shock" you with high prices when you need new shocks and struts. Instead, we offer quality repairs at affordable prices. Our goal is to guarantee your complete satisfaction. We accomplish this by catering to your needs as well as your budget. Let our auto shop provide shock and strut replacement to ensure your car has the cushion it needs when going over bumps and taking turns. Steer yourself in the right direction if you need power steering repair. Instead of paying high prices for this service, trust the experienced and honest mechanics at our auto shop or reliable work at affordable rates. You don't need to suffer with stiff steering. Let us address the problem and provide an accurate solution. Depend on our car repair shop for prompt and efficient repair services. We have the specialized tools and training to resolve your steering problems. Is your steering wheel vibrating or creating strange sounds when you turn? If so, you could need power steering repair. It may be something as simple as a fluid flush. However, the issue could involve your steering column. Fortunately, we are experienced auto technicians that identify the precise problem and perform reliable repairs. 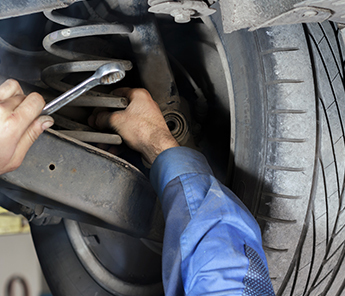 As a car owner, you probably pay little attention to your vehicle's shocks and struts. However, you probably recognize the signs of auto suspension problems. If your car has become bouncy, it bottoms out over bumps, or the steering is not centered, it may be time for suspension alignment. Enjoy straight and smooth driving again by bringing your car in at the first sign of problems. Whether you need shock and strut repair, power steering repairs, or something more serious, we can steer you in the right direction again. Contact us to schedule an inspection if you're having suspension or steering problems. We proudly serve customers in Powell, Lewis Center, Delaware, and Dublin, Ohio.